Resveratrol – A naturally occurring polyphenol demonstrating diverse health benefits supporting joint, cardiovascular, metabolic and neurological health, plus an immune system booster and powerful antioxidant. Atlantic Kelp – Rich in vitamins, trace minerals and amino acids which are essential for complete nutritional support. Sea kelp is also a natural source of iodine beneficial for thyroid and glandular health and it improves digestion and reduces stress. Flaxseed Oil – An excellent source of Omega-3 fatty acids are critically important for neuromuscular development, skin health, coat quality. Lecithin – A sustainer to the nervous system and brain promoting alertness and steady nerves. Lecithin improves digestion of fats for a healthier liver and improved metabolic process. Ingredient Source: All the ingredients in Resvantage Canine® are naturally occurring. Resveratrol is found in more than 70 different plant varieties including grapes, peanuts, pomegranates, blueberries, pines and Giant Knotweed. Resvantage® sources its trans-resveratrol from the Knotweed plant; Botanical name - Polygonum Cuspidatum. This is the same source of pharmaceutical grade resveratrol used in studies conducted by the NIH and other medical research institutions and universities. Capsule Integrity: Resvantage Canine® is manufactured to cGMP* standards and a rigorous quality assurance program. It is lab tested during all phases of the process insuring that the active compounds are free of heavy metal toxicity and microbiological contaminants. RESVANTAGE CANINE® is Laboratory Tested and then encapsulated in an oxygen-free, nitrogen-rich environment by the Capsugel® division of Pfizer utilizing their exclusive patented Licaps® process. This helps prevent oxidation and ensures that each capsule retains its potency. Nitrogen Packed and Air Tight Sealed for Maximum Integrity. 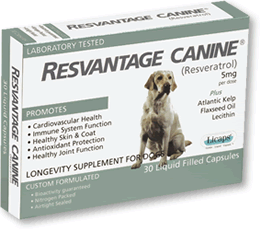 Administration: Resvantage Canine® capsules are intended to be taken orally. Suggested Use: Give dogs 1 capsule daily for every 30 lbs. If giving more than one capsule daily, divide between AM and PM. Safety/Resveratrol: Resveratrol is well tolerated and safe for long-term daily use. There are no known side effects or contra-indications associated with resveratrol supplementation. Precautions: Response to supplements varies by individual. If your dog exhibits any symptoms that concern you, discontinue use and contact your veterinarian. Warnings: Not for puppies less than six (6) months old. Storage: Store at room temperature, between 59°-86° F (15°-30° C). Brief periods of up to 104° F (40° C) are permitted. How Supplied: Carton containing 30 liquid-filled capsules. If for any reason you are not satisfied with your purchase, please contact us at support@resvantage.com.